On 4th October 2017 the Colchester and North East Essex Building Preservation Trust announced that it had finally come to an agreement with Jumbo's owner. The agreement comes after prolonged negotiations following the publication last May of the Trust's Options Appraisal, which proposed two preferred schemes for the development of the tower. This has since been narrowed to one preferred scheme, which sees a ground floor restaurant with a kitchen above, a smaller restaurant together with exhibition space on the floor below the tank, with the latter being used for events. The Balkerne Tower Trust, which published its own Options Appraisal in 2009, is delighted with this major step forward. 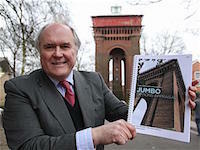 It is the best news about Jumbo since it was sold off by Anglian Water in 1987. The scheme put forward preserves the wonderful character of the building, keeps the tank intact and retains the open space between the legs. There will be public access and plenty of historic interpretation. This is the vision we have been advocating for many years. Both the implementation and transfer of ownership to the Colchester Building Preservation Trust depend on a successful application to the Heritage Lottery Fund. A stage 1 application for this will be made in spring next year. Much work remains to be done in preparing this. Credit is also due to Paul Flatman for being the first of Jumbo's private owners prepared to sit down and talk with a conservation charity about a worthwhile future for this unique building.